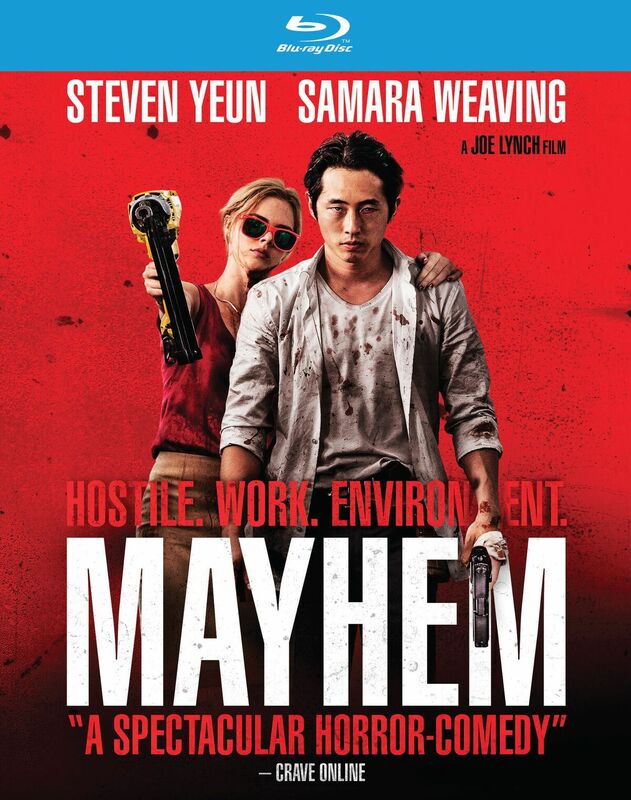 RLJ Entertainment recently send us information for their upcoming release of Joe Lynch's "Mayhem". The film stars Steven Yeun (“The Walking Dead,” Okja), Samara Weaving (Three Billboards Outside Ebbing, Missouri, The Babysitter, “SMILF”) and Steven Brand ("Teen Wolf," "Secrets and Lies"). Special features on the DVD and Blu-Ray includes “Creating MAYHEM: The Making of the Film,” an audio commentary with director Joe Lynch, Director of Photography Steve Gainer & Editor Josh Ethier and more. "Mayhem" hits retail on December 26th. RLJE Films (NASDAQ: RLJE) will release the action, horror film MAYHEM on DVD, Blu-ray, and Ultra High-Definition 4K/Blu-ray combo on Dec. 26, 2017. Directed by Joe Lynch (Everly, Chillerama), the feature film debut from writer Matias Caruso stars Steven Yeun (“The Walking Dead,” Okja), Samara Weaving (Three Billboards Outside Ebbing, Missouri, The Babysitter, “SMILF”) and Steven Brand ("Teen Wolf," "Secrets and Lies"). 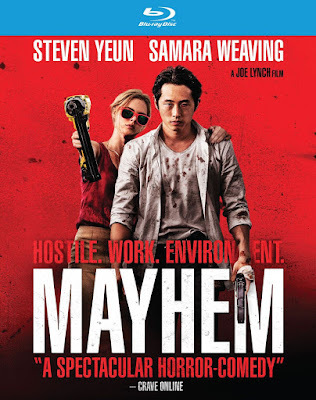 RLJE Films will release MAYHEM on DVD for an SRP of $27.97, on Blu-ray for an SRP of $29.97 and on Ultra High-Definition 4K/Blu-ray combo for an SRP of $35.97. The MAYHEM DVD, Blu-ray, and Ultra High-Definition 4K/Blu-ray combo includes the bonus features “Creating MAYHEM: The Making of the Film,” an audio commentary with director Joe Lynch, Director of Photography Steve Gainer & Editor Josh Ethier and more.